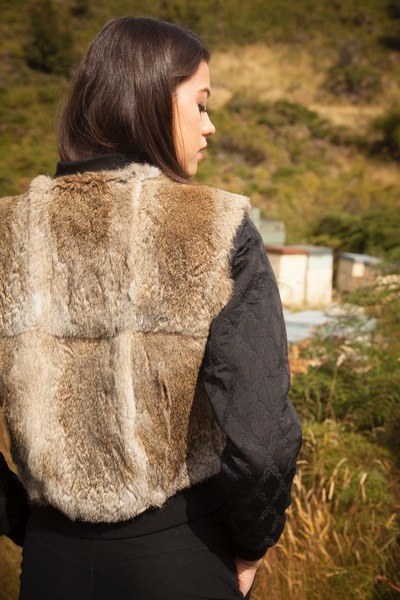 Named for it's unabashed naturalness this bomber is all you can rabbit fur. There's nothing quite like shrugging on a bomber jacket and this one is quite irresistible. Trimmed with leather and featuring soft quilted and insulated cotton sleeves with an embossed baroque pattern, this jacket is all about cosy, casual luxury. All Lapin bomber jackets can be commissioned in a myriad of fur and fabric combinations. Baroque quilted cotton sleeves, NZ Wild Rabbit Eco Fur (dyed black) front & back, Leather zip trim & facing, Merino/nylon ribbing, Viscose lining (black), 50% wool 50% cotton sleeve interlining.